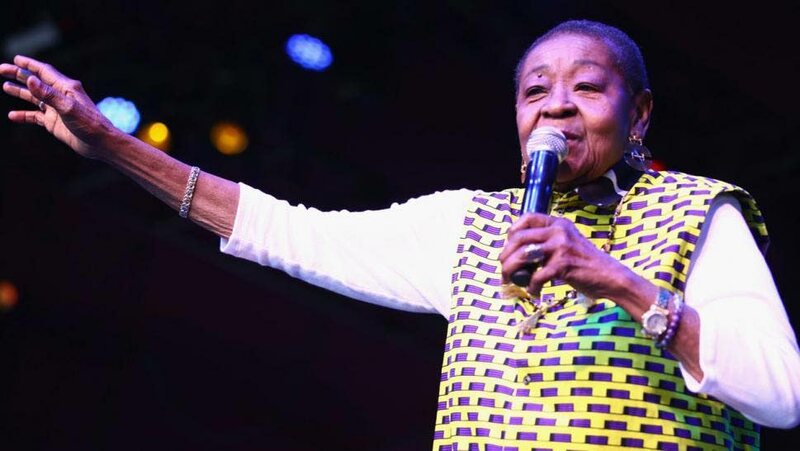 Calypso Rose took a tumble on stage, but got back up to set fans "on fire" in her historic debut as the oldest performer, and first calypsonian, at the Coachella Valley Music and Arts Festival in the US on Friday night. Rose, who turns 79 on April 27, lost her balance as she sang her 2019 hit Young Boy, alongside soca star Machel Montano, at Indo Empire Polo Club, California. A male fan had joined her on stage, and although he had his arm around her, Rose as she danced back, slipped and fell. But even as she was helped into a sitting position Rose kept on wining, and regained her composure, when helped up, to finish her song and go on to close her set with Fire! Fire, with all her signature energy – although a bit subdued. Fans loved it all, and gave her, Montano, who she called her son, and her band a rapturous applause as they bowed three times before leaving the stage. In a statement today, Minister of Tourism Randall Mitchell praised Rose (Linda McCartha Sandy-Lewis) for her achievement as the oldest entertainer at Coachella, where she is due to perform again on April 19. “It is with a deep sense of appreciation that we congratulate Calypso Rose for continuing to promote T&T’s culture on the international entertainment stage and we salute her. She continues to be one of our most prolific, international cultural ambassadors on every stage, whether it is in the US, France or the Caribbean,” Mitchell said. Mitchell also commended Montano as one of the country's international cultural ambassadors, noting his performance with her at the festival. Rose, an advocate for non-violence against women, was awarded the nation’s highest award, the Order of the Republic of TT in 2017. Her album Far From Home won the World Album of the Year at the Victory de la Musique ceremony in France in 2017, which is considered to be the French equivalent of the Grammy Awards. She was the first national to win the 2016 Artist Award by the World Music Expo, which is an international networking platform for the world music industry. US entertainment magazine Billboard wrote about Rose last week, highlighting her history-making journey as a calypsonian and women's advocate. Reply to "Rose tumbles, but sings on at Coachella"